I have recently returned from a 3 day visit to Berlin. It was in the company of three generations of the same family: grandfather, father and son/grandson. The grandfather was born in the late around the start of World War II. The father was born just after the Berlin Wall went up. The son was born in the last few days of the 20th Century. This is of little relevance to what I am about to write other than adding, perhaps, some additional poignancy to impressions the city gave me. The first thing that struck me was just how exceptionally flat the whole city and surrounding area is. It makes Holland seem, well, bumpy at least. The next thing I noticed was the network of blue pipes going around the city centre at about 4 metres off the ground. It turns out that these two things are connected. The blue pipes are not, as urban myth would have it, carrying beer, but are temporary installations carrying vast quantities of melt water away from deep building sites. You see, Berlin is built in the middle of a vast glacial outwash plain and is fundamentally unstable to its very foundations. That is a major analogy for the city’s history for you! 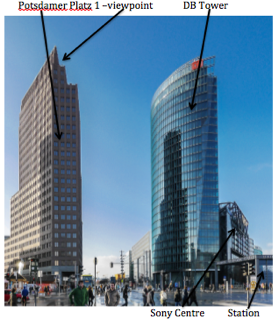 Historical instability is evidenced at every turn in the city centre, focussed around Potsdamer Platz, which was at one time the busiest road junction in Europe. Google its name and look at images over the course of the 20th Century. There are plenty of these historical images all over the place in central Berlin. One old building caught my eye in particular. Where had I seen something very similar? Where else but Hiroshima. 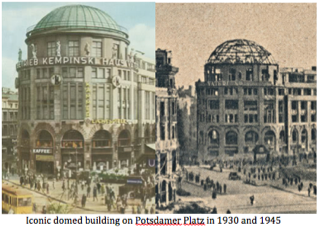 The main difference between these is that in Hiroshima, the building has been preserved within the boundaries of the Peace Park, whereas in Berlin, it has beed razed to the ground and replaced with impressive modern high rise edifices. But these have been a very recent addition (since the wall came down). Prior to this the site was in (or adjacent to) the notorious Death Strip – the barren empty wasteland, c.150 metres wide behind the Berlin Wall. Peace Park v Death Strip; a very different post war experience. The situation in Hiroshima and Berlin in 1945 was, of course, very different. Hiroshima was pretty much abandoned initially and had to pick up the pieces with negligible foreign assistance. Berlin, on the other hand, was overrun by foreign forces from both East and West. As the capital of the Third Reich, it was a prized token of victory for all involved. It was to be carved up, in a faintly ridiculous compromise, as the tensions between the communist ‘Victors from the East’ and the neoliberal ‘Victors from the West’ manifested themselves. As Europe found itself divided down the centre of Germany by the Iron Curtain, Berlin found itself 100 miles behind the curtain. The Western Allies were not having that! Berlin was too symbolic to be ceded entirely to the dastardly commies! Thus it was that a bunch of politicians sat around a table, a bit like they once did to crudely carve up Africa, to rip Berlin in two, half to the East and half to the West, with the Western Allies further carving their half up into three portions – British, French and American. Was this absurdity the work of the same fools that conjured up the State of Israel? Probably not, but it was symptomatic of the imperial arrogance of the victors that they felt empowered, by military success, to do pretty much as they liked with territory and people for whom that territory was home. Not that I have a great deal of sympathy for Germans, and especially Berliners, of the time. In the final analysis, they facilitated the Nazi rise to power; they provided the massive labour to create a formidable war machine; they were complicit (by, at the very least, turning a blind eye) with all the atrocities of the regime. I have always struggled to get my head around how that could ever have happened. A visit to the Typography of Terror exhibition (on the site of the SS HQ) helps to shed some light on this. Here some extracts on display. I have studied such material before and struggled to conceive how it actually happens like this. But the politics of the UK and USA over the last few years has seen this sort of history repeating itself via the Tories/UKIP in the UK and the Republicans in the USA. It confirms all my worst suspicions that we are on a very slippery slope indeed. The stark clash of ideologies between the left and the right, and its ability to divide people, is graphically in your face the moment you walk out of the Typography of Terror exhibition. For there is one of the longest remaining stretches of the Berlin Wall, preserved for posterity. This is 200m of what was once 150km encircling the whole of West Berlin. 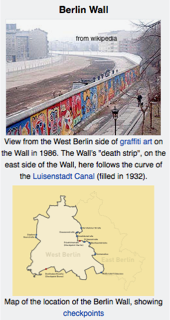 It was put up in a matter of days in 1961 by the communist East German authorities, calling it the “Anti-fascist Protective Wall” (they saw the Western neoliberals as tantamount to fascists). They had grown impatient of way the existing borders were proving porous and allowing literally millions of East Germans to ‘escape’ to the West. The reality was that prior to the wall going up, Berliners were commuting backward and forward across sectors, for work or visiting relatives, largely unhindered. This came to an abrupt end as the Cold War’s icy grip took hold of the city. The symbolism of this outpost of western liberal values in a sea of communist oppression made West Berlin an irresistible magnet for many, especially musicians and artists; the likes of David Bowie, the Beatles, Lou Reed, Brian Eno, Leonard Cohen, Bruce Springsteen and many more all took inspiration from time spent there. A visit to the GDR Museum gives the lie to the propaganda that life was unremittingly grim in the East. Living standards for the poorer working classes were probably higher than the west with good quality, well equipped homes for most. But the inefficiencies of the Soviet economic model meant that access to a good range of what might be considered ‘luxury’ goods was pretty pathetic and bound to generate discontent when things were so patently different just across the wall. Nothing embodied this more than cars. While West Berliners had their Mercs, VWs and BMWs aplenty, East Berliners had 15 yr waiting lists to get their hands on a Trabant!! 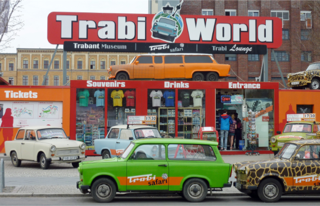 That today you find Trabi World just along the road from Checkpoint Charlie, paying tongue-in-cheek homage to this piece of shite simply underlines the farce of the situation. Farce played its part in the moments that led to the wall finally coming down. Russian President Gorbachev was leading a peaceful revolution based on glasnost (creating openness) and perestroika (economic reconstruction) but the East German leader, Eric Honecker was a hardliner who was having none of it. It was a botched news conference that tipped the dominoes. Under growing pressure to make concessions similar to those in Russia, some minor changes to travel rules were to be announced. The bumbling Politburo member running the conference, Günter Schabowski, read the news release for the first time on air. Much of his reading was garbled, but a few phrases popped out: that trips abroad would be “possible for every citizen,” starting “right away, immediately.” Shorn of their context, these phrases mistakenly gave journalists and TV viewers the impression that the wall was open. With the public awaiting news eagerly and with confidence that the times were a-changing, huge numbers descended upon the wall in Central Berlin and the sheer weight of numbers forced the guards to stand aside, despite a lack of instruction to do so, and the Wall was joyously overwhelmed, and Honecker’s regime was swept away with it. Today, fragments of Wall dominate the souvenir shops. ‘Wallpeckers’, as they came to be known, hacked away all around the wall, creating holes and breaches very quickly. It was a symbolic act and everyone would have wanted a piece of the action and a piece of the wall. Some stretches have been preserved, but even those bear the scars of the Wallpeckers. 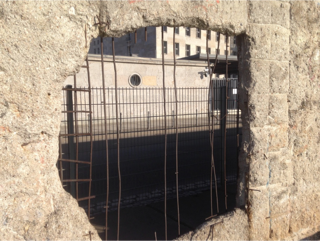 This ‘pecked’ hole is in the preserved section that runs along where the SS HQ once was. 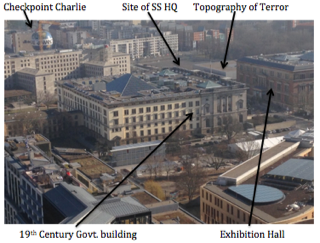 Across the road that was once part of the death strip, is the former Nazi Air Ministry building, that survived pretty much unscathed. That authoritarianism has not been banished is symbolised by the modern CCTV on the wall. Layer upon layer of oppression in one image! This is what I have found, looking back at my pictures from Berlin. Most of them tell multi-layered stories. These were taken from the top of one of the modern skyscrapers in Potsdamer Platz, built on the east side of the wall, in what would have been in Death Strip less than thirty years ago. This is looking due north towards the Brandenburg Gate. Built in the 18th Century as a monumental gateway to the Prussian monarchs’ palace, it survived two world wars to then find itself just on the east side of the Wall that ran up the road from Potsdamer Platz, with Tiergarten Park on the west side of the wall. The wooded parkland extends for 210 hectares (520 acres). Originally part of royal hunting grounds, they were completely stripped of all trees towards the end and after WWII as the Berliners desperately needed firewood to survive the bitter winters. The cleared land ended up as vegetable allotments as they fended off starvation too. The trees are back today, largely replanted by Berlin residents apparently, but it still comes as a surprise to learn that none of the trees there are much more than 60 years old. The area to the east of the road/wall was once the fortified communist-imposed Death Strip. That it now has the Holocaust Memorial and huge US Embassy on it, side by side, seemed appropriate and disconcerting in equal measure. Just off picture in the Tiergarten (in the old West Berlin) are much smaller individual memorials to other groups targetted by the Nazis: homosexuals, Sinti & Roma, Russians. 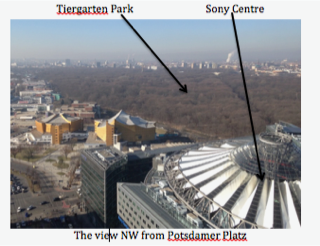 To the SE of Potsdamer Platz is the what was the nerve-centre of the Third Reich. It used to be called Prince Albrecht Strasse, but was renamed by the East Germans after a prominent member of the communist resistance to the Nazis, so is now Niederkirchnerstrasse. It was a sector border street and had the Berlin Wall built along it in 1961, running up to Checkpoint Charlie. The Government building dates back to the Prussian Landtag but was subsequently used for Berlin City government functions right up until very recently, including during the Nazi era. The Exhibition Hall, built in the late 19th century has been a cultural and art establishment throughout the turbulent times around it. It is severely pock marked by gunfire, but avoided major damage. During my visit, it was the central venue of the annual Berlin Film Festival, not that I had chance to partake. The one film that did catch my attention will not surprise regular readers – an Israeli comedy called “Holy Air”. It is set in the Arab Christian community of Nazareth, and tells the story of a man who, after his wife gets pregnant, decides it is time to make it big and provide for his family by selling bottled holy air to tourists. Sounds like the perfect scam – as bits of Berlin Wall will run out eventually. (Or will they?) The juxtaposition of this film being promoted literally next door to the exhibition describing the systematic programme to eliminate the Jews, which in turn leads to the formation of the Israeli state got my head in somewhat of a spin. Walls, barriers, divisions. Separatism, fascism, communism, neoliberalism. 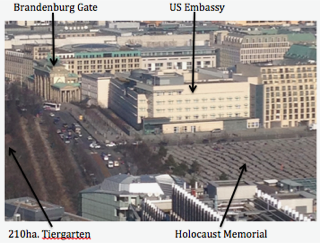 All in evidence, often simultaneously, from many vantage points, but especially around Potsdamer Platz. The line of the wall is marked on the ground along its full length, except where it has been built over. This mostly takes the form of a double line of cobbles. Around Potsdamer Platz alone, this threw up some incongruous and/or poetic images. Here we have the double line of cobbles crossing a footpath and road before disappearing for 30m or so under a new office block. 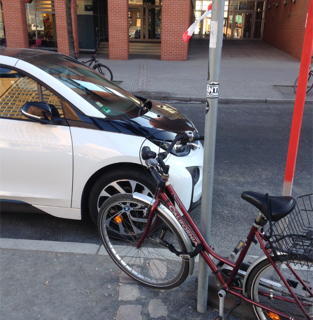 Parked across it is, facing east, a woman’s bicycle; facing west, a brand new BMW i3 electric car on a free charging point. Two very different perspectives on sustainable transport staring at each other across an entrenched divide. Here we have the line of the wall interrupted by the modern reincarnation of underground station. An historic site, it saw the city’s first rail terminus in the 1830s and the city’s first underground lines in the 1930s. The Nazi’s wanted to have it complete before the 1936 Olympics to demonstrate the magnificent state-of-the-art technology and efficiency of the Third Reich. Technical issues – largely related to the difficult geology eluded to at the beginning of this piece – meant it was not actually completed in time, much to Hitler’s intense annoyance, no doubt. In the Cold War era, it was seen as a possible weak link in the barrier that the wall represented and as such was heavily patrolled underground by GDR soldiers throughout the time of the Wall. Its ultra modern technology and efficiency today would have had Hitler purring. 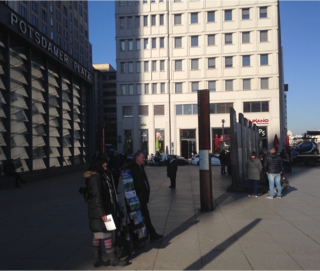 There are just a few small fragments of the wall left in Potsdamer Platz today, with them utilised to give information about the sites history. Smack bang on the line of the wall in the foreground of my picture is another of those incongruities that mess with my mind. For lo and behold, it is the Jehovah’s Witnesses. It is really difficult to assimilate all the stories and messages to be gathered around this historic city. Very little of it is uplifting. Even the big shiny modern tower blocks remind me of instability as soon as I realise they belong to banks (e.g. Deutsche Bank)! The two most uplifting things I saw may not inspire many. During my visit to the Espionage Museum, amongst all the 007 nonsense and displays of gadgets, was a story that ought to be more familiar to us all. At the height of the Cold War the Americans undertook some provocative military exercises that had Russian militarists convinced that the Americans were about to launch a nuclear first strike conquest. Pressure quickly mounted for a pre-emptive strike to be launched from Russia. It was only the intelligence received from spies within the American military that convinced Russia that the manoeuvres were indeed no more than exercises. In other words, the spies averted a nuclear apocalypse. In what sense is this uplifting? It tells us that it is secrecy that is dangerous. It is the preserve of tyrants and crooks. All the time we know what is going on we can have rational responses. So hooray for all the spies, all the whistle blowers, for Wikileaks, Edward Snowden, Chelsea manning et al. There is no place for secrets of any sort in democratic government. National security can never be enhanced by allowing governments to keep secrets from the people. This much we have to learn from the Nazi era. In the digital era, relationships between people and the powers that be are evolving fast. 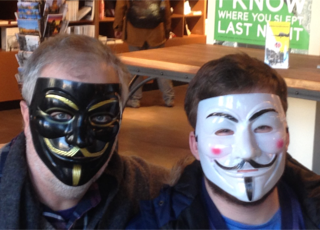 This is why we should all be broadly supportive of the Anonymous network of activist and hacktivist entities, and why I was pleased to see the Espionage Museum promoting this too. I convinced my 17 yr old Government and Politics student companion to this viewpoint I think – such that we bought some souvenirs that will hopefully see much future use. If Berlin has anything to teach us, it is that putting our faith in governments to act in our best interests is foolhardy at best. Glasnost/openness, transparency and accountability has to be the bedrock of any true democracy. Any thing less is a sham. We live in a sham. And shams can quickly become shameful. Freedom is only possible when the masses grasp it. The Norman Foster designed dome (the top of a gherkin anybody?) 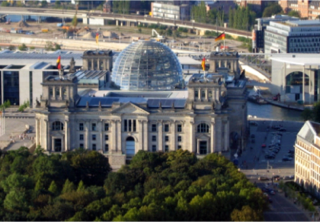 on top of the Reichstag building was added in the 1990s to symbolise the reunification of Germany and a new era of open, transparent democracy. Well, that was the theory at least. This entry was posted in Uncategorized on February 19, 2017 by Bridgend's Green Leftie.